While USD is getting more support from the economic data such as the US factory orders, EUR bulls fail to take the control of the chart. 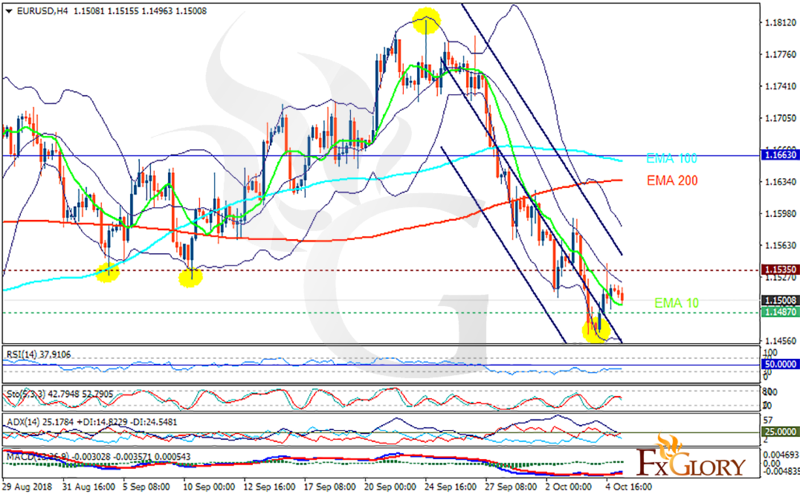 The support rests at 1.14870 with resistance at 1.15350 which both lines are below the weekly pivot point at 1.16630. The EMA of 10 is moving with bearish bias in the descendant channel and it is below the EMA of 200 and the EMA of 100. The RSI is moving below the 50 level, the Stochastic is moving in middle ranges and the MACD line is above the signal line in the positive territory. The ADX is showing sell signal. The indicators are showing mixed signals. The price is fluctuating within the Bollinger bands, the support level breakthrough can push the price down towards 1.145.